(Photo credit: Wikipedia)Type I diabetes, formerly known as juvenile diabetes, appears early in life and means the body does not have the ability to produce insulin. 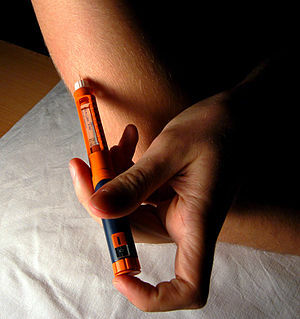 Insulin is a hormone that converts glucose to energy. If glucose remains in the blood stream it can result in cell destruction. Type II diabetes is the inability of the body to produce enough insulin or break it down adequately. Type I diabetes can strike at or before adolescence, where type II is more gradual to develop. While there are differences in the onset of diabetes, if treatment is not started early and pursued, the results can be devastating because both involve neuropathy, or the destruction of nerves in the body. You need to pay close attention to the feet, because this is a common location for nerve damage to first show signs. Early symptoms of neuropathy can include a numbing or tingling in the feet. If you have diabetes, one of the major areas of concern is your feet. This is because the loss of feeling can allow a sore or break in the skin to go undetected, resulting in infection and possibly leading to amputation. People with diabetes need to make sure they are being evaluated by a podiatrist annually, or more frequently if needed. • Always wear shoes and socks to protect feet. • Bathe feet daily pat dry and apply lotion. • Examine feet daily and have your doctor treat minor problems of the feet and ankles. This includes corns, calluses, ingrown toenails, sores and athletes foot. • Advise your doctor of sores or breaks in the skin. Seek immediate treatment. • Wear closed toe and heel shoes that fit properly. • Follow the diet and exercise program your doctor recommends. With over 25 million people in the U.S., more than 8 percent of the population, the risks and complications from diabetes are staggering. If you are a person with diabetes, call Dr. Teichman’s office today at (610) 432-9593 to make sure you are scheduled for your annual exam. Never neglect your feet.